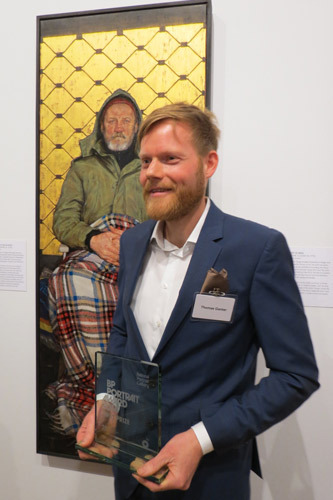 with his winning portrait "Man with a Plaid Blanket"
I'm very grateful to Thomas for giving me an interview when English is not his first language - and to Neil Evans at the NPG for letting us stay on to get a quieter gallery for the Interview. The portrait selected as the best of the work submitted in 2014 for the BP Portrait Award is called Man with a Plaid Blanket. It's painted using oil on canvas and it measures 1600mm x 600mm. 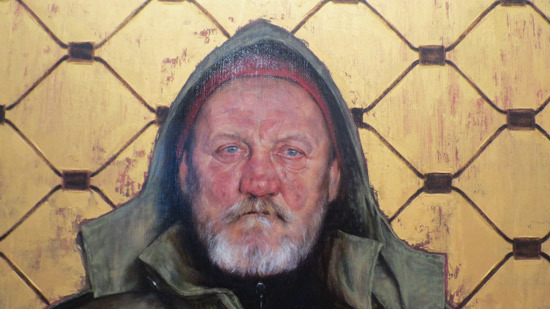 ‘All the judges were struck by the intensity of the sitter’s gaze and how every texture and surface was rendered in intricate detail - from the icon-like gold chain fence to the rose in the crumpled paper cup’. I have to say this painting does not render well at less than high resolution so if you disagree with the comments I can only refer you to the comments of both the other prizewinners who both agreed you had to see it in person to appreciate why it won. "Most of my canvases try to capture to beauty of visual appearances while including a message, whether it's the impact of globalisation or the social inequality." His aim it to get us to reframe how we see the world. His prizewinning portrait does just that. He invites us to consider the juxtaposition of wealth and poverty and the worth of the ordinary human being. The museum he had been visiting on a rainy afternoon was The Städel. One of the most important collections of Old Master paintings can be seen in the art museum called the Städelsches Kunstinstitut und Städtische Galerie in Frankfurt am Main. This includes masterpieces by Dürer, Grünewald, Holbein, and Elsheimer, Rembrandt, Vermeer, Brueghel, Rubens, Mantegna, Botticelli, Tiepolo and Batoni, Poussin and Chardin - see examples on the website. I'm left wondering whether the Altar retable 'Mio da Siena' was an important influence. A pointer for those submitting in future years - do take a look at the very many ways in which people have been portrayed in days long gone. There is rarely anything completely new but there is certainly an awful lot to learn from. Thomas spent two months working out his ideas and how to represent them in terms of visual language on the canvas. Three artists he has identified as influential to that process are Velazquez, Hans Holbein and Jan van Eyck. He then spent three months painting the portrait. His model for the work was a local homeless man called Karel Strnad who earned money by washing car windows. It's certainly a work which repays seeing in person and closer inspection. Suzanne du Toit, the 1013 winner, admired his painting of the plaid blanket very much. I particularly like both face and hands. I think aspiring entrants to this competition should note that yet again we have a complete upper torso. In fact all three shortlisted paintings had both face and hands. This is what I had to say about it when the works were shortlisted. Bear in mind I had the tremendous benefit of having seen the high resolution photos of each work. Which means I'm officially very please to have yet again spotted the winner! I must do a countback sometime to work out my strike rate! Thomas works in the art business - but his business is illustration. He cofounded Kawon, an animation and illustration agency in 2001. It has a seriously impressive website showcasing their work - but it's a very different sort of work to this award-winning portrait. "Being an illustrator helps my by the daily exercise of drawing, painting and thinking in concepts"
He was born in 1974 in Limburg - so 40 this year - and as you can hear in the film he heard his work had been selected the day before his 40th birthday. Thomas studied illustration at the University of Applied Sciences Wiesbaden, Germany and in 2001 got a Diploma: Trailer Animation and Character Expressions. Thomas also used to hold a Lectureship for Life Drawing and elementary drawing. He refers to his painting as a passion and it's one which also allows him to follow his own ideas rather than those relating to his clients' needs or projects. Painting might not be what he does full time but he certainly put a lot of thought and effort into this painting. I liked the idea that he continued to develop his techniques when his first submissions did not succeed. It's a message which should bring hope to those who have submitted in the past and are thinking about submitting again in the future. TOMORROW - I'll be posting video interviews with the second and third prizewinners - Richard Twose and David Jon Kassan - and after that it's my video review of the exhibition and then it's on to the BP Travel Award! Great article and video interview, thank you! It certainly looks like gold leaf to me Anne since he's scraped into it and it's got that 'look'. However I did forget to ask!